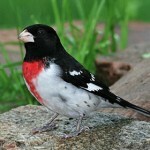 Description: Smaller in size than Blue Grosbeak, and bill is much smaller. Adult male is deep blue overall with some black in wings and tail; lacks wing bars. Winter males are mostly brown with some blue showing on rump, wings, and underparts. 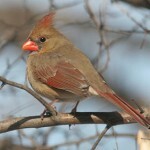 Female is dull brown above; buffy below; faint streaking on breast; and indistinct wing bars. Immatures resemble female. Habitat: Relatively open floodplain and upland forests, forest edges, shrubby areas, and second-growth or disturbed vegetation. Where in Nebraska: Uncommon spring and fall migrant and summer resident in eastern Nebraska. Local breeder in west. 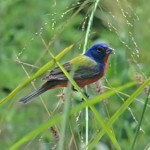 Western limits confused by hybridization with Lazuli Bunting. Status: Range appears to be expanding in the west and southwestern U.S.
Field Notes: Males sing well into August, later than most other songbirds. 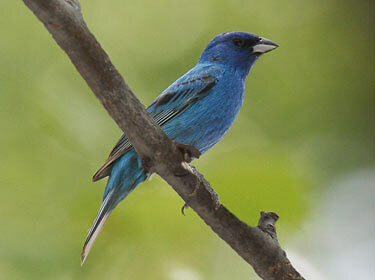 Fun Facts: Indigo Buntings migrate at night and use stars for orientation. They can return to their natal breeding grounds even after being held captive and released in a different location.